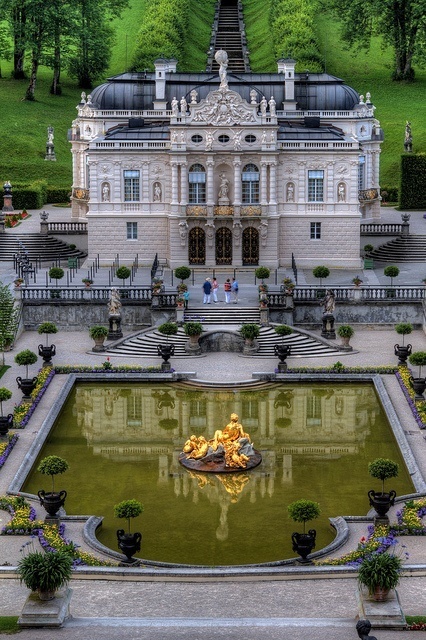 Linderhof Palace (German: Schloss Linderhof) is in Germany, in southwest Bavaria near Ettal Abbey. It is the smallest of the three palaces built by King Ludwig II of Bavaria and the only one which he lived to see completed. Ludwig already knew the area around Linderhof from his youth when he had accompanied his father King Maximilian II of Bavaria on his hunting trips in the Bavarian Alps. When Ludwig II became king in 1864 he inherited the so-called Königshäuschen from his father, and in 1869 began enlarging the building. In 1874 he decided to tear down the Königshäuschen and rebuild it on its present-day location in the park. At the same time three new rooms and the staircase were added to the remaining U-shaped complex, and the previous wooden exterior was clad with stone façades. The building was designed in the style of the second rococo-period. Between 1863 and 1886 a total of 8,460,937 marks was spent constructing Linderhof.